Confused by the wide range of Central Processing Units available? Keeping up to date with all the different CPUs is quite difficult, which CPU is fitted to your PC? If you wanted to upgrade, are the CPUs still available? Each time you separate the CPU from the heat sink you should replace the thermal paste. Clean off the old paste first and be sparing with the new paste - it doesn't use much. Intel, AMD and Cyrix have all made CPUs that fit into this socket. This is now virtually obsolete. Few PC manufacturers use this architecture. 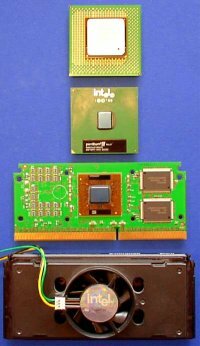 This is the Slot developed by Intel for their original PII, PIII and Celeron CPUs, later replaced by the Socket 370 (PPGA). The processors here are all Pentium III. The top 2 are Socket 370 (PPGA), showing top and bottom. The bottom 2 are the slot 1 variety. 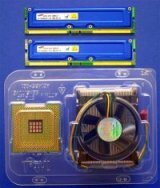 Shown here without and with the heatsink assembly. Confusingly there are 2 socket types for Pentium 4s. 423 and 478 pin sockets. These are not interchangeable. 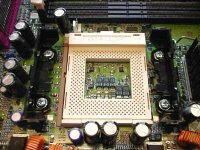 So be aware when attempting to upgrade the CPU in your motherboard! 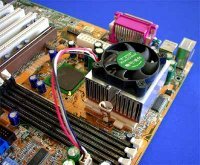 ** AMD CPUs run at high temperatures. Make sure that your CPU cooler is up to the job and reliable! 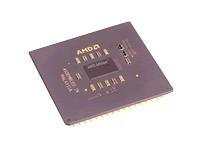 The Duron chip from AMD.